Pabst Blue Ribbon Gets A Reprieve, Will Continue To Be Brewed By MillerCoors For nearly 20 years, MillerCoors has brewed nearly all of Pabst's beers. The arrangement will now continue past 2020. 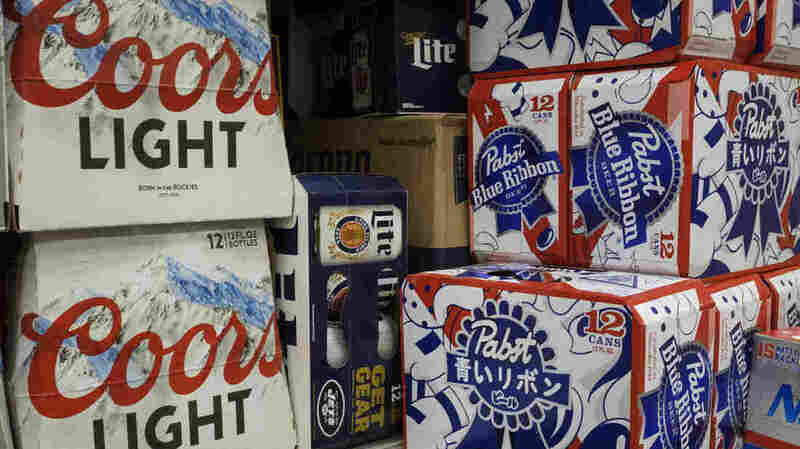 Pabst Brewing and MillerCoors have ended a legal fight that lasted more than two years, extending a contract under which MillerCoors brews beer for Pabst. MillerCoors had been trying to terminate the 20-year arrangement when the current contract runs out two years from now — but Pabst balked at that idea, saying the contract includes options for an extension. The company filed suit, daunted by the task of keeping PBR, Schlitz, Old Milwaukee, Colt 45 and other beers in the market without MillerCoors brewing them. Details of the deal were not released; in separate statements, both parties described it as an "amicable" end to the case that was first filed in March 2016. In the clash, MillerCoors said it no longer made financial sense to brew for Pabst. In its suit, Pabst said MillerCoors was essentially trying to put it out of business. Despite its name, Pabst Brewing does not brew most of the beer it sells. "Really, the way to think about them is more as a beer marketing company," as Matthew Weinberg, an economics professor at Ohio State University, told Marketplace last week. In addition to national labels such as PBR, the case raised the threat that Pabst would no longer be able to keep longtime regional beers flowing in their local markets. The company's portfolio ranges from Pabst Brewing to Lone Star in Texas and Olympia in Washington state. For example, The Baltimore Sun's coverage ran under the headline, "Is Natty Boh at risk of extinction?" Those have been put to rest, after the two companies worked out a settlement in the court case, as a panel of jurors deliberated for nearly two days. As it considered a potential decision, the jury asked to review more than 40 pieces of evidence, according to records from the Milwaukee County Clerk of Circuit Court. With a new deal reached, a Pabst spokesperson says the company "will continue to offer Pabst Blue Ribbon and the rest of our authentic, great tasting and affordable brews to all Americans for many, many years to come." The contract-brewing deal was made in the first place because Pabst and MillerCoors once viewed their customers as coming from very different parts of the market — but that dynamic has shifted since 2000, due to the beer industry's being reshaped by consolidation, the surge of craft beer and other changes. "Maybe there are more customers out there [now] that are kind of indifferent between buying, for example, Miller High Life and PBR," Weinberg told Marketplace last week. "So I think it's become more of an issue now than maybe it used to be." The contract-brewing dispute came four years after Pabst Brewing was sold for hundreds of millions of dollars to a partnership between entrepreneur Eugene Kashper and TSG Consumer Partners, a San Francisco private equity firm. The company is currently based in Los Angeles.